I’ve been pretty distracted from HGK lately, what with the holidays, the kids being off for spring break, and general life getting in the way. Plus I’ve been preparing a lot of my tried and true recipes (Mock Chopped Liver and Mina de Masa, to name a few). Not much to report blog wise! Except maybe that trip we took to Great Wolf Lodge where the food available was so abominable that when I was describing it to my friend Chris-Anna I actually started to cry. How is it that as a society we have devolved so far? Home cooking is definitely where it’s at for me these days. There’s really no restaurant that I desire to eat at in Cleveland, unless you count the Whole Foods salad bar. Last night’s slow food dinner is something that I have been wanting to mention on HGK for many months now. It all started with that visit to Northstar Cafe in Columbus, OH where my daughter and I shared their famous beet burger and an extraordinarily delicious rice bowl. 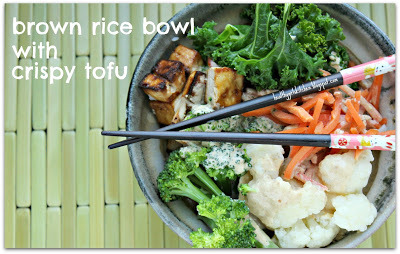 I vowed to learn how to recreate the bowl in my own kitchen, for I just could not live without this in my life. And it’s not very often that we get down to Columbus. This recipe is not, as they say, rocket science. But a few months ago, when I posted on Facebook about my cooking experiment with an Asian rice bowl, I met with demands for a recipe. These recipes are everywhere on the Internet. Plus, a strict “recipe” this is not. So this blog posting is more of an idea about a dinner that you can put together–and while not a quick one, it’s so delicious and nutritious that you will crave it forevermore once you have your first bite. (1) Cooked brown rice, but really you could use whole wheat noodles or rice noodles. (2) Blanched vegetables, anything you like. Blanching is key. You don’t want undercooked or overcooked vegetables, and blanching is the perfect technique to get the perfect veggies! Plus, with one big pot of boiling water, you can quickly blanch your way through a whole host of different vegetables. (3) Roasted tofu, but you could use tempeh for a twist. (4) Peanut sauce, or really any sauce that you desire. (5) Optional Garnishes: fresh cilantro, sliced scallions, chopped peanuts. The first time I made a rice bowl, I made the fiercest peanut sauce. Too bad I didn’t write down the recipe! I’ve been trying to recreate my magic ever since. It hasn’t been the same, but here’s what I did last night. And believe me, it was good. Real good. But it just wasn’t that magical first time. So if you have a killer peanut sauce recipe, or know of a link to one, please, leave it in the comments section! The quantity of each vegetable is up to you. I prepare a lot so that we can have leftovers for days. If you run out of peanut sauce or brown rice, you can easily whip up some more, or just use the leftover cooked vegetables in a salad. Bring a large pot of water to a boil. One vegetable at a time (ie all of the cauliflower and then all of the broccoli), immerse in the boiling water. When vegetables are blanched to desired tenderness, remove from water with a serrated spoon and put into a bowl. Repeat with all vegetables. Preheat oven to 400 degrees. Drain tofu and press to remove excess water. Prepare a cookie sheet by lining it with aluminum foil. Cut tofu unto 3/4 inch cubes. Lay out on prepared cookie sheet and carefully (ie not too much!) drizzle soy sauce or Tamari over tofu, tossing tofu in excess soy sauce on the tray. Roast for 45 minutes. Remove from oven and transfer to a bowl. 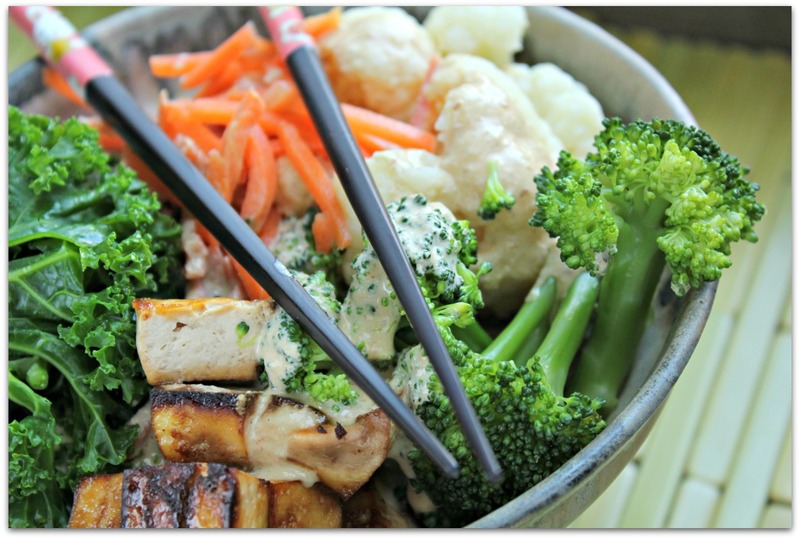 Load everything into a bowl and drizzle with peanut sauce. Garnish at will. Just about die of happiness. What’s your go-to Asian sauce recipe? Any known tricks for cutting down on the fat? 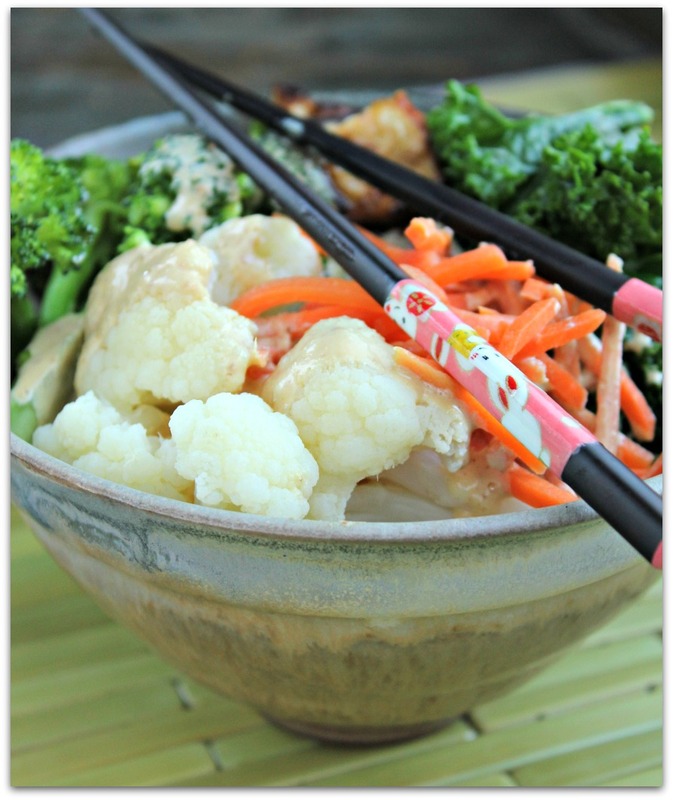 What other vegetables do you like on a rice bowl? Have you been trapped lately in a city/hotel/vacation spot that is a food desert? Where were you? How did you handle it?